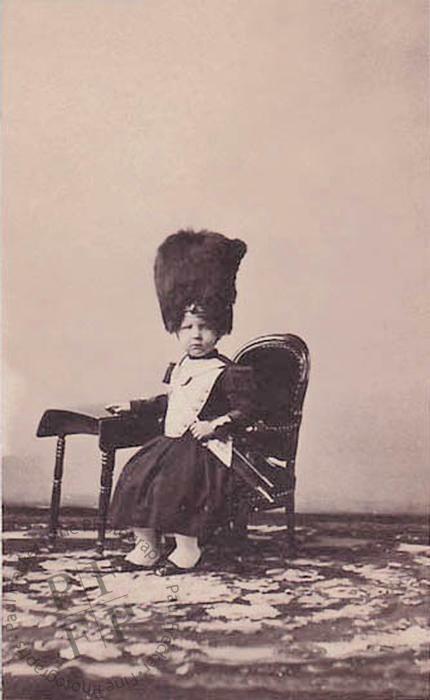 Although seated in a piece of miniature furniture beside a scaled-down table, the Prince Imperial is dwarfed not only by the towering busby of his uniform but also by the expanse of empty space which surrounds him. In spite of the sitter's small size, Disdéri has not moved the camera closer to his subject in order to fill the frame, but has instead maintained the customary distance already established for full-length, adult portraiture. The short focus of the carte-de-visite lens did not allow for much manipulation of the camera, with the result that many carte portraits of children in this period appear poorly composed and unbalanced.